If surgical excision in the line of gangrenous demarcation hastened natural separation of mortified limbs and reduced suffering, it left a discharging wound which, at best,might heal only after several months to leave a fragile scar, prone to breakdown, and a stump often incapable of bearing an artificial limb. Later, more-aggressive removal of bone promoted closer apposition of skin margins which improved cicatrisation, yet these stumps remained fragile and often unsatisfactory for prosthetic fitting. In response to gunshot injuries, amputation through sound tissues, although more painful, was to produced healthier if slow healing. 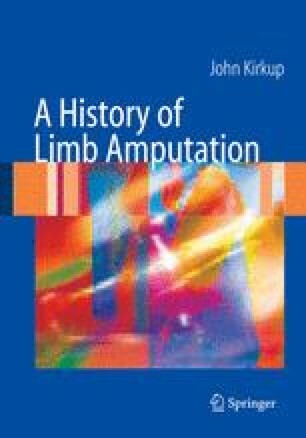 Eventually, flap amputations proved a key to better functional stumps, assuming the bone was not infected and discharged chronically, always a possibility before the chemical and thermal sterilisation techniques of the later 19th century.